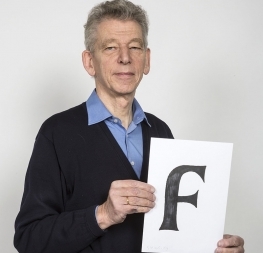 In honour of the late Dr Gerard Unger, renowned Dutch type designer and educator, and in celebration of what would have been Unger’s 77th birthday in January, we are hereby announcing the renaming of the TypeTogether Typeface Publishing Incentive Programme to Gerard Unger Scholarship. 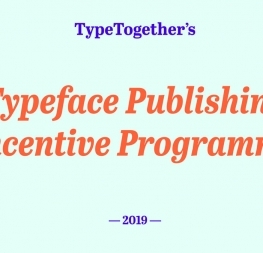 TypeTogether started the Typeface Publishing Incentive Programme in 2014 as an initiative to help promising typeface design students develop their careers. Dr Gerard Unger, who taught José Scaglione and Veronika Burian and inspired many more generations of young type designers, was an avid supporter of the Incentive Programme from the start. He had a lifelong interest in education that manifested in his various teaching engagements, his research, and the practical as much as theoretical texts and books he wrote. Gerard had a keen eye and a meticulous sense for detail, mixed with much wit and a kind of cheekiness — all characteristics which shaped not only his work philosophy, but also his outlook on life in general, and which encouraged us, his students, to do more and do better. Gerard had a hand in sparking José and Veronika’s interest in editorial type design whilst teaching at Reading. He certainly inspired TypeTogether’s commitment to a collegial atmosphere at work by being a consummate gentleman, always respectful to his peers, and firm in his views. 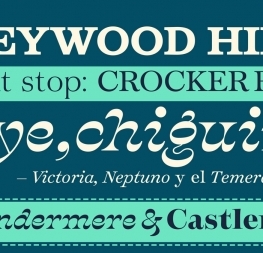 Gerard believed in TypeTogether and we are deeply honoured that he trusted us to extend and then publish some of his typefaces — Coranto2, Capitolium2, Alverata, Sanserata. Our initial apprehension of suggesting to redraw Gerard’s accented letters, given his strong sense of ownership for his type designs, was quickly dissolved. He truly showed his professionalism when he trusted our judgement and knowledge of accents, and over time a wonderful, trusting relationship developed. Dr Gerard Unger passed away in late 2018. Due to his advanced stage of cancer, it was not a surprise to us that it could happen, but only how soon. We so enjoyed the partnership we had with him and had discussed with him several times about how to honour him going forward. He was too kind a man to ever answer straight, so we have taken it upon ourselves. We would like to honour Dr Gerard Unger as the mentor and teacher who always generously shared his knowledge, so we are proud to announce that we are renaming our Typeface Publishing Incentive Programme as the Gerard Unger Scholarship. This annual programme will continue to support and offer guidance to at least one selected recipient with the aim of enabling exceptional designs started during a course of study to be finalised and published commercially upon their course completion. For details go here. TypeTogether bows before you, dear Gerard — our mentor, teacher, colleague, and friend. With this scholarship we hope to carry forward your values, educational commitment, dedication to type, and above all, humanity! 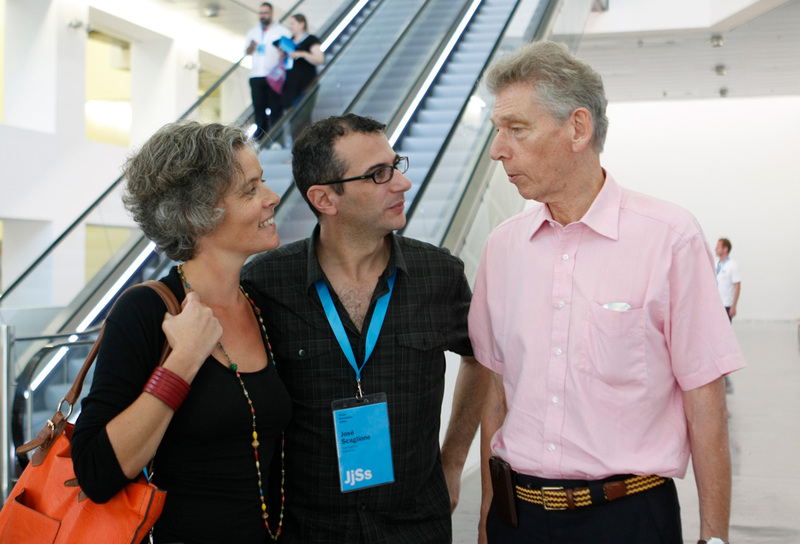 (From left) Veronika Burian and José Scaglione together with Dr Gerard Unger during ATypI in Barcelona. Photo by Elena Veguillas. 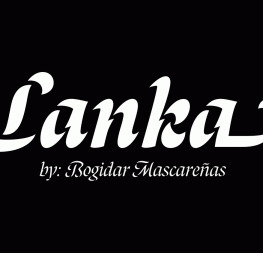 In one of his early conversations with my class at Reading in 2011, Gerard Unger gave us one seemingly simple piece of advice: If your brief requires designing for a script other than Latin, think of your project not as Latin and non-Latin, but as, say, Greek and non-Greek or Tamil and non-Tamil, placing the Latin as secondary. Project after project, I have come back to this little nugget. Interpretable in infinite ways and a reminder to use thought in tandem with action, it has always made me think of Gerard and his gentle provocations that helped me navigate my first few months of designing type. I first met Gerard over 15 years ago, when studying at the department of Typography and Visual Communication at Reading University. After the first couple months I realized he liked to meet and talk things over during breakfast. In the same way some people favour social life at lunch, coffee breaks, or sharing a drink after office hours, he favoured early breakfast. Sometimes it was a real challenge to wake up early for these meetings, especially when in the middle of a busy conference when nights can be — and usually are — very long. But the prospect of an early coffee with Gerard, chatting about life, travels, history, projects, and of course about some typography was always the perfect incentive to get up and start a new day. I’ve had the privilege of working with Gerard on numerous projects over the years, during which I became familiar with his signature combination of focus, knowledge, energy, openness, and humility. One of the most important things he taught me was the supremacy of the eye over numbers in making decisions about the design of type. Gerard’s contributions to typeface design and design education are undeniably great, and though his death is marked with great sadness, both he and his work will remain inspirations to many. 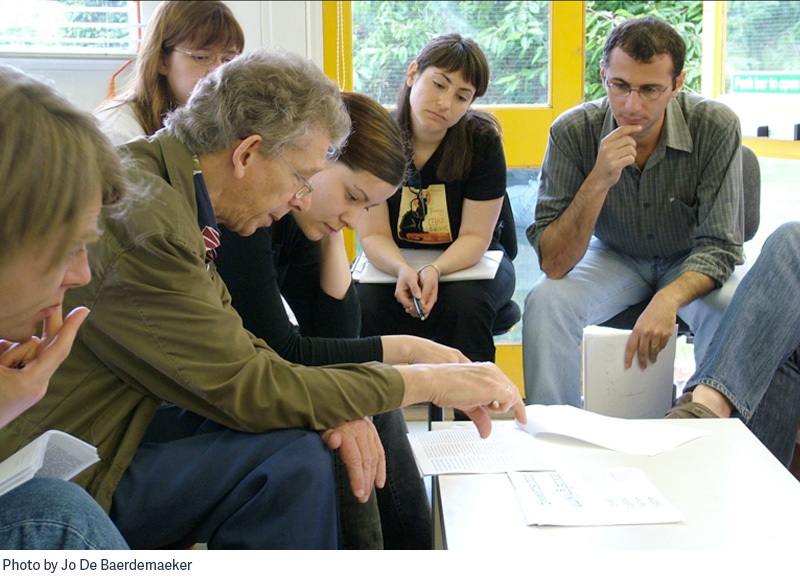 Gerard was a generous person with his colleagues and his students, and I count myself privileged to have been among those type design students in Reading in 2003. His sense of humour and his hospitable manner are remembered by everyone that met him even once. His last book, Theory of Type Design, came as a gift for all of us, and the launch evening, which sold out a large lecture theatre in Rotterdam, was the best way to celebrate it — a gathering of hundreds of friends and colleagues, speakers who shared deeply moving memories, as well as an opportunity for them to tell him face-to-face how much he had inspired them and how much they’d learned from him. An ideal celebration of his life and work! My encounters with Gerard were manifold and I have some very fond memories. One such is my visit with José to the Unger home in Bussum whose architecture is rather special — all angles and steep steps with pastel coloured walls, but also very warm and welcoming. In a way this dichotomy pervaded Gerard’s personality on many levels. He was serious and cheeky at the same time, always trying to see humour in life, with a pinch of provocation, which very much manifested in his particular fashion sense. I still see him in the kitchen wearing some funny apron chatting with his wife, Marjan, and us, whilst busying himself with some delicious dips. Gerard was not so well anymore, but his incredible optimism and resolution not to give up will stick with me forever.